Welcome back to my BLOG dear Friends!! :) I ♥ YOU!!! Stamps: Stampabilities, House-Mouse Designs, called "TAILS OF TRUE LOVE", from 2004, # HMGR1009, and features Amanda & Maxwell. I followed this month's Verve Sketch # VLVFeb2011 found HERE. PaperPlay chall #4 Layer it Up. Wanna Learn more about these adorable characters that Ellen Jareckie creates???? This past Saturday on FACEBOOK, House-Mouse Designs® hosted their very "1st Annual Meet Artist Ellen Jareckie" event. It was so much FUN to learn about her and her love for animals that inspires her to create these sweet images!! To learn more, check out the TEXT from that fun FB Conversation by clicking on this link HERE. Also finally, I NEED to mention that at House-Mouse & Friends Monday Challenge Blog , we are looking for our next Great Monthly Guest Designer to join our Team!! Soooo, will it be YOU?? If you love these adorable House-Mouse, Happy Hoppers and Gruffies characters, come play along with us and show us your fabulous creativity to be considered! Check out the details HERE. Thank you so much for stopping by today and for your sweet support that means so much!!! A lovely and adorable card! it's a beautiful card america. Awww... So so sweet! I think the charms are the best accents! Adorable! toooo cute card, love the charms you've added! WOW....this is such a stunning card my jaw dropped as soon as I saw it....its amazing. Thankyou so much for entering my candy & becoming a follower your blog looks fabulous & so I've become a follower. Looking forward to seeing many more of your creations hun. Take care. So beautiful! Love the little red bling around the heart and the heart. The classic combination of black white and red is always wonderful. Gorgeous card...such a cute image and a great take on our theme....thanks for joining us this week at Stampavie and More. A beautiful creation, I love your choice of image. 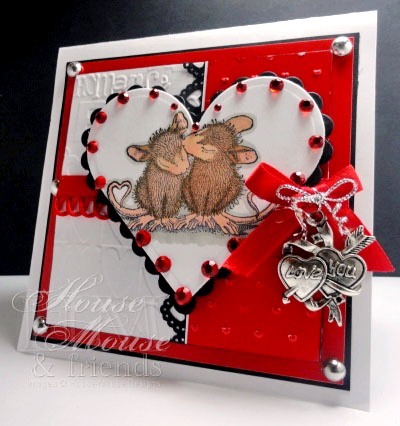 oh this is gorgeous...love the layout and love the red and white...such an adorable stamp too!! Thanks for joining us at Paper sundaes this week. America, you gotta love these two adorable mice.........ahhh...love! Beautiful color combo, I love black red and white! So many great details. The sketch is so pretty, might have to borrow that one! Gorgeous card America.Thank you for playing with Speedy's Friends. Gorgeous card, Love the image in the heart. What a gorgeous card,I love the image and the colours. what a wonderful cute card. i love the mice in the heart and the bling around htem. cute, cute card, I love the sketch you used, fntastic!!!! Fantastic embossing and charm! Way to go! 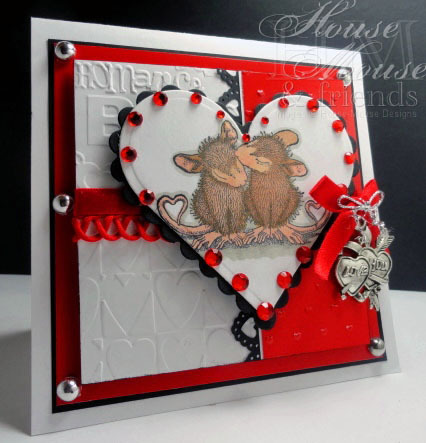 Thanks so much for sharing your LOVE/VALENTINES creation with us at Creative Inspirations this time round! Hope to see you next time too! What a sweet card! Every detail is PERFECT! Great Job! Tahnks for playing along with us at Crafty Hos! We hope you'll join us again soon! Hello you - hope you're well and full of Mousie mug coffee - rofl!!!!!!! Love your card, stunning colour combination, fantastic colouring of the little cuties and your embellishing is spectacular. How sweet, America! Such a wonderfully adorable Valentine! Absolutely GORGEOUS card, beautiful details and colouring........ Thanks for joining us at Creatalicious!! Darling card- love the sweet image. Thanks for joining the Stamps R Us challenge- we hope to see you again! Thanks for joining us at PIO this week! Have a GREAT day! thanks for your comment, yes great minds do think alike ha! ha!